The Sous Vide Thermapen thermometer has been specifically designed for Sous Vide cooking and areas where precise temperature measurement is required. 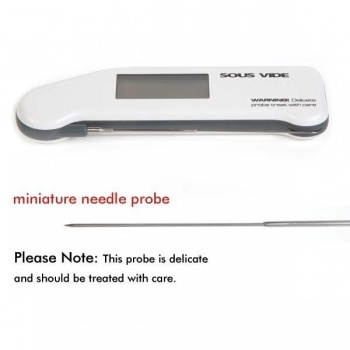 This model incorporates a miniature, stainless steel needle probe that has a reduced tip Ø1.1 x 60 mm, that conveniently folds back through 180 degrees into the side of the instrument when not in use. The Sous Vide Thermapen features the same specification as the SuperFast Thermapen and includes a FREE traceable calibration certificate.